East Metro Park is built on a 261-acre site and serves as a regional park for the East Travis County area. A key design objective was to create a park that complemented the natural beauty of the existing site. 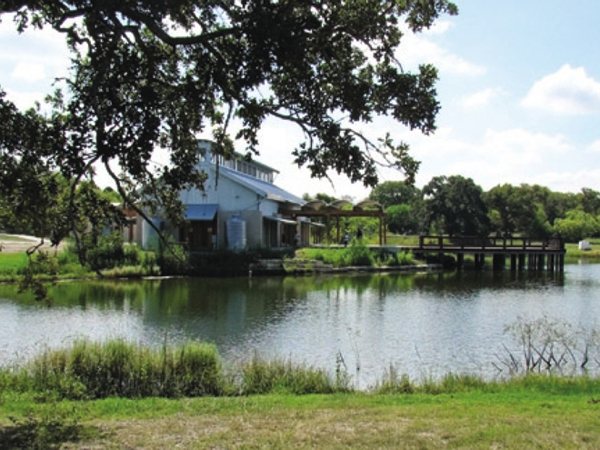 Design strategies included maximizing tree preservation, maintaining natural waterways, integrating existing ponds as key site amenities and preserving open space. The park’s overall design aesthetic was derived from the site’s history as a Blackland Prairie farmstead. Built elements such as restrooms, concessions, signage and playgrounds are derived from simple vernacular forms and materials. Park amenities include baseball fields, soccer fields, concessions/restrooms, a swimming pool, hiking trails, picnic areas, playgrounds, fishing piers, tennis courts and a meeting facility. Open spaces feature wildflower meadows, restored tall grass prairies, wetland areas, post oak savannahs and wooded creek beds.